I had a small rant on facebook last week. The previous weekend my twitter and facebook had filled with overjoyed atheists and angry Christians sharing a link to a video of Stephen Fry going off on one in response to a question about what he would do if he met God (or something like along those lines). I’m a fan of Stephen Fry’s work – particularly on his documentary series raising awareness about endangered species, LBGTQ related issues and bipolar disorder – so I do follow him on Twitter and watch interviews with him on talk shows, so I’ve heard him and seen him talk in this way before. At times he is respectful of a person’s right to believe differently from him and other times he’s come close to suggesting or insinuating that being a Christian should be outlawed. And I do take issue with that latter take on things. It’s this kind of fundamentalism that I find quite terrifying wherever it comes from. Because I find the idea of trying to enforce people to sign up to one particular worldview (or that we should outlaw and stigmatise one particular type of worldview) very disturbing. Because you can take one look at recent history to see what it can lead to. Genocide. Holocaust. Murder. Hate crime. Stigma. A lot of people thought my rant was directed at what Stephen Fry said, but it wasn’t. It was at the comments several of my atheist friends had made while sharing articles and memes that the video going viral had inspired as a result which seemed to all take the view that if you believed in God you were uneducated and idiotic. I did make the mistake of taking them personally. My thought process on the sight of them was: “well, if that’s what you think about Christians, that’s what you must think about me“. I’m sure that in reality they didn’t give it a second thought when they shared stuff or how it could come across. I know I’ve been plenty guilty of sharing opinions in a ten second ‘share’ on social media that could be misleading to my actual thought process. But just as I was posting my ‘Quote of the Week’ on my facebook (which I do every Monday or as close to Monday as possible after the post goes live) this appeared on my feed after being shared and ‘liked’ by a friend. The comments underneath it were all talking about how stupid and incapable of thinking Christians are. It was as they say ‘the straw that broke the camel’s back’. Had it not been the timing of seeing that, I probably would have sighed and moved on. But I do love my quotes, they do keep me going. Some of the quotes on my wall are passages that talk about love, grace and faith. Heck I have a Zulu word that means hope and faith permanently tattooed on my foot! Is it wrong to be inspired by acts of love, grace or faith? I’d had enough, and having spent the better part of the last 19 months critically thinking (whether I want to or not…just about my whole Masters is about critical thinking and questioning everything we are taught!) and the fact that pretty much anyone who has studied the bible or discussed matters of faith with me can most likely tell you how much I rant about the need for choice, to understand that preachers are capable of talking crap as much as they are capable of speaking truth, challenge and encouragement. Or my frustration at times when I’ve watched Christians lap up the words of the most currently fashionable Christian preaching celebrity on the block without critical reflection on their teaching (and whether it matches up with their application). Actually being church with me is probably quite exhausting. 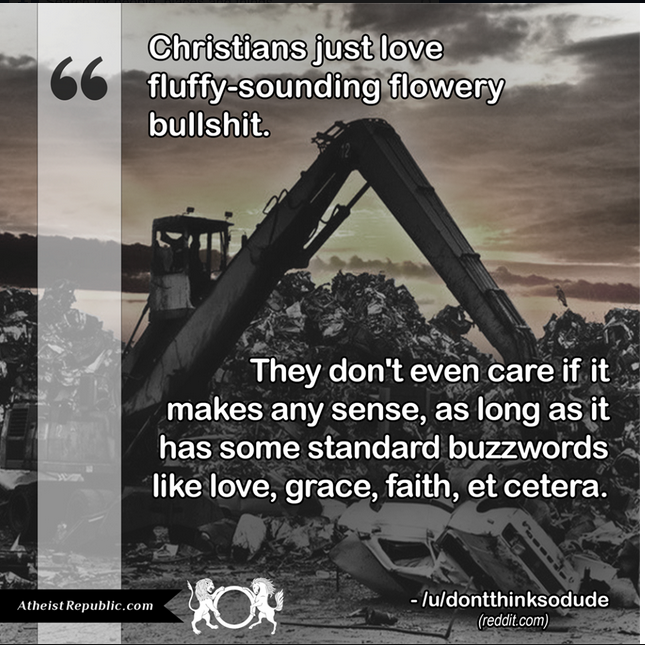 Apologies to those disappointed in the atheist republic community that my quote of the week choices so far this year have not included fluffy flowery words such as love, faith and grace. Blessed was included last week so hopefully that counts and gives you a little fuel to make me out to be a brainless idiot who doesn’t think for herself. You may think I’m weird for believing in a God who gave free will to choose what we say, do and believe in because of course it does mean we have the ability to both help as well as damage the world. Maybe I’m weird for being glad we are not all programmed to think and act the same way. I kinda like having friends who can both share and differ with me on their beliefs about all sorts of things in politics,artistic taste, lifestyle choices, family culture, laws and the existence of god(s) or lack thereof. People on Facebook seem to love a good quote meme. And most of my friends who told me I should keep sharing my favourite quotes and reflections on them don’t believe in god so I’m guessing they don’t find my thoughts on life totally offensive? I’m hoping they would tell me of they did. So I’ll keep sharing my “fluffy” quotes each Monday. I’m off to wash my hair. I just want to thank two of my atheist friends who were the first to hit ‘like’ on that status, and another who asked me about the rant the next day – leading to a great discussion outside a lecture theatre about religion, atheism, history and the way the institutionalisation of education is affecting our abilities to critically reflect and consider beliefs that we don’t hold ourselves. I really appreciated that and encouraged me that even if we don’t believe the same things about the existence of anything spiritual, we do believe in freedom of speech, freedom of religion (for want of a better term) and mutual respect. Because I do love having discussions about the deeper issues of life…values, culture, morals, ethics. And I especially love it when I can radically disagree with a friend and yet our friendship not be damaged by disagreeing because we will take time to try and understand where each other are coming from. I may not agree with your beliefs but I respect the fact that you stick to them. I admit, I find the idea of religion silly and I can only hope someday you leave your faith and come over to the dark side (we have cookies btw) but until then, by all means, post whatever you want. I loved that, and had to giggle because I feel the exact same way – I respect my friends for sticking to their beliefs and feeling able to voice them, but at the same time would love them to know God the way I feel I do. But I would never in a million years want any of my friends to feel that I think they are dumb for rejecting the idea that there is a God or worse (as one friend once mistakenly believed) that I thought they deserved to go to some weird cartoon like hell with horned creatures, flames and pitchforks. I feel I should also point out that I constantly question God, and spent a long time during my first years of faith being really angry at things that had happened in the world and to me as a child. A couple of years ago I really questioned if God even existed as I questioned the teaching of church leaders who I believe abused the authority they had been given. And I questioned whether the God of the bible had values that I felt I could follow. Did God and I agree on issues I felt passionately about? So I’m not sure how much I really ‘stick’ to my beliefs! Certainly I will stand up for them and voice them. But it would be wrong to say I have not had doubts, questions or that they’ve not changed as I’ve studied the bible and reflected on life experiences, books, art, culture and other media I’ve been open to learning from. Oh, and PS I love this response to the Stephen Fry video very thoughtfully written by my good friend Rebecca. Rebecca is one of the most un-judgmental people I know and I don’t think she’d mind me telling you that we’ve had many conversations about life’s big (and small) questions. I was most disappointed to hear that, a bit like when our mutual friend shared about her atheist beliefs on her blog, some Christian bloggers stopped being friends with them. Their loss, I say. And I reckon Dudley Field Malone would agree. Because we learn most when we disagree – and we continue learning when we learn can see past that to the human being, the experiences and thought processes that have led to their conclusion, and have them be willing to listen to how we came to ours too. Sometimes it means we will be shocked, sometimes it means our beliefs will evolve into something that looks a little different, sometimes it leads to us deciding we aren’t sure what we believe is right or wrong, and other times it plain just doesn’t matter but it has been an interesting conversation. Last year while studying educational theory, one of our lecturers showed us this video. Ivan Illich’s book Deschooling Society was probably one of the few uni books I actually read from cover to cover last year. At first I was defensive, but the more I think about how institutionalised education has become the more I agree. Now about once a term one of my Rangers or Guides has to stop coming because of the amount of homework they have to do. After spending 7 hours at school. Part of this is that learning that would be far better done outside of a classroom situation is now being expected of teachers on top of teaching their subjects. Part of it is the ridiculous government assessments that are expected all year round which take up so much of teacher and pupil time. Non formal learning is so important, it makes me angry that our government don’t give space for kids to take part in it. Why can’t school be left at school?! Apart from the fact that so many children don’t have the support they need to do work at home. Yes, the ability to learn is important, but so often it is dependent on the resources at home and it puts privileged kids at an unfair advantage. I have had so many young people come through school education believing they are destined to be unsuccessful because their skills and gifts are not developed in a classroom situation. They are the kids who struggle to read or are terrified of public speaking. And the most worrying part is that education has become about learning a list of facts decided by government workers and achievement is assessed on ability to memorise, agree with and spew back facts taught to them. Children are not taught that they can have a different opinion or that other people may have a different take on things. Perhaps the only exception is Religious, Moral and Philosophical Studies, and even then they try and get kids to learn ‘facts’ about religions and worldviews that are simplistic and not representative of reality. Surely, this is a problem. And I wonder how we solve it…a new take on learning and education needs to be found. Because stating that what a words a kid should be able to recognise or which times tables they need to memorise by a particular age is not education. J.K. Rowling is someone I’d love to have a ‘coffee’ with sometime, because so often the messages she writes and speaks are the ones I struggle to articulate. She’s just one of those women that I don’t actually know, but look up to as a role model. I think one of the best things about the Harry Potter series are the lessons from the development and interaction of the characters as they grow up and go through life. 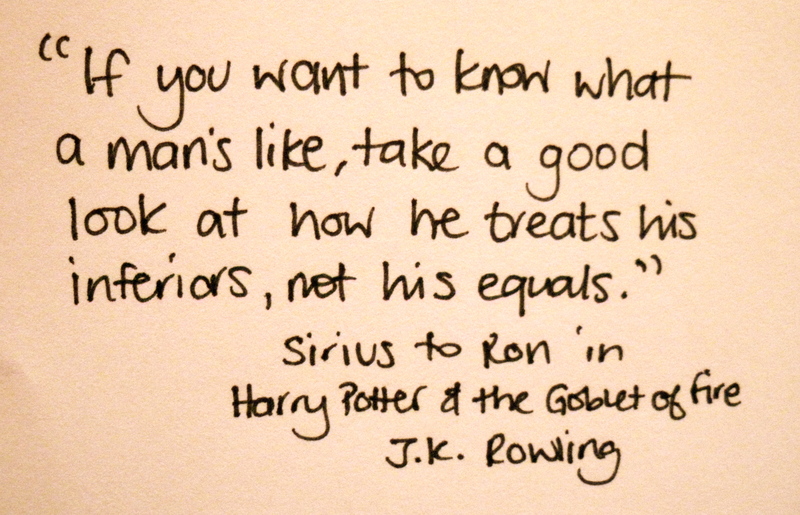 This piece of advice from Sirius to Ron is a little gem of wisdom and one that sadly, not many people in our culture take seriously enough. This time last year, I was the manager of an organisation. A small charity, but I was the person in charge. I had become very used to being in that role, and when you’ve been a manager and the responsibility lies with you it’s hard to shake off. I naturally like to be prepared, assess risk, ensure people are looked after and problem solve. I like to encourage people. I also always felt that I should never ask someone to do a job I wouldn’t be prepared to do myself. The second half of last year was spent unemployed and looking for work after I was made redundant when our charity closed. I struggled to find work, and in October/November started applying for Christmas temp roles in the city centre. I ended up with two temp jobs, and this week finished up at both. It was strange to be at the other end of the chain of command, and it made me realise how important that quote is. Both workplaces had friendly staff, but the way they finished were very different. On my last day in one, the manager just said goodbye and I walked out the door after staying an extra half hour as another member of staff hadn’t turned up for their shift. On my last day at the other job, the manager took each temp staff finishing aside in turn down to her office, she guided us through end of contract forms, informed us how we would get our P45 forms, final pay and asked us how we’d found working there. She thanked each of us for our help, and every one of us got a thank you card signed by the four managers. I know which job I felt more appreciated and encouraged by. In this case it wasn’t that I got treated like crap, but I really felt the difference. I came home from one feeling deflated. I came home from the other feeling sad but of value. I’ve seen cases of this as a youth worker too. I remember the moment I made a decision to turn my whole career path around. I was in my third year of university studying Geography planning to become a Geography teacher and working part-time with a local community education project. I was in a high school, and I watched a teacher screaming at pupils as he came down the corridor before they’d even done anything wrong. The clincher was when one day a group of rambunctious teenage boys came bolting over to our wee workshop stall and asked us for the pens and info cards we would always give away. They turned around gleeful at their wares (many kids liked to collect the cards and pens which came in different colours) and the teacher bawled at them for stealing the pens and took them off them. He then came up to me and told me that he had told them off for stealing our pens. I was angry ” we give them away, and they know that. They took them and thanked us for them. They weren’t stealing“. The teacher was silent for a moment and said “oh well. they won’t be bothering you again” and walked away. I was fuming. A few of the boys could see him talking to me, and the teacher didn’t even go up and apologise to them for his mistake. What was worse is his idea that the boys not coming to talk to the youth advice workers was a good thing! I worried that I’d become one of those teachers whose power went to their head and became bossy and shut people down without listening first or apologising for making a mistake ‘because I’m the teacher’. I went to my boss and told him about the incident. He shook his head and told me how many times he’d seen that kind of behaviour from teachers. That was the moment I chose Community Education over School education. I wanted to help people learn as my equal, not as my inferiors. We should all want to treat people as our equals rather than our inferiors.